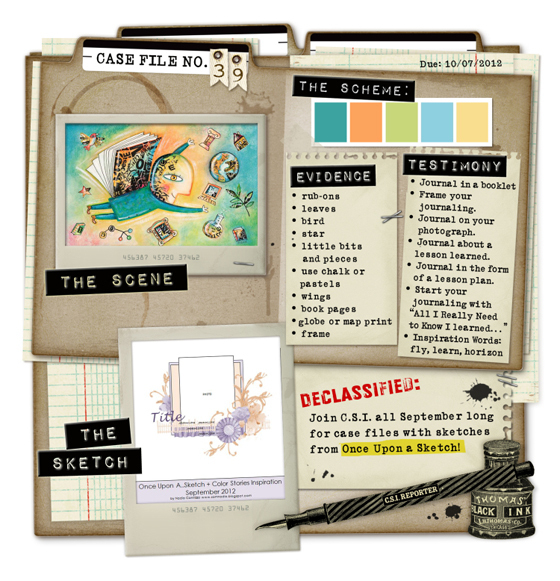 From the evidence items I used: birds, frame, stars, bits and pieces, globe, book print, and I was inspired by the 'learn' theme of the testimony items. 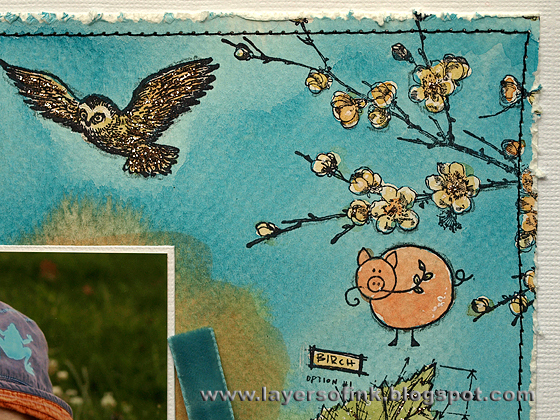 As you can see, I was very inspired by the inspiration photo and did something similar, but with stamps and watercolour. 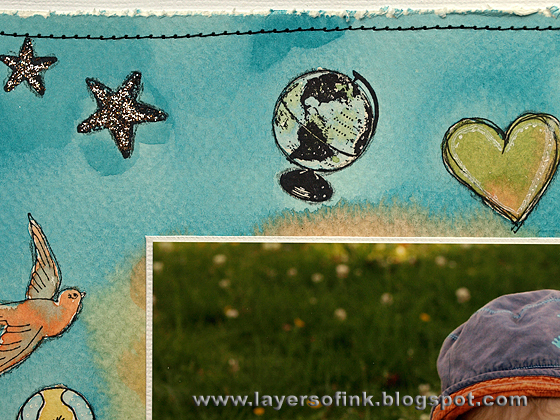 I first stamped a mix of images on watercolour paper using Archival Jet Black ink, I picked stamps that had to do with nature, play and learning. I was planning to first paint all the images with masking fluid, but forgot to do it before I started to paint. I wanted a soft wet-on-wet look in how the paints mixed on the layout, but to get that you need to work fast and there was no way I would be able to work so fast around all the stamped images. I painted the images with masking fluid, let it dry, then rewet the whole sheet and added paint on the remaining parts. All the paints were mixed beforehand to fit the colour combo. I didn't get the nice blending that I wanted to have -compare the bottom part of the layout where the paint flowed together, to the harsher lines at the top. When the paint was dry, I removed the masking fluid and painted all the stamped images in the colours of the colour combo. The heart was doodled with a waterproof pen. After the paint dried, I added some shading to the images with a black coloured pencil. Then I added some Platinum Stickles here and there for a bit of shine and it fitted with the whimsical feeling of the layout. 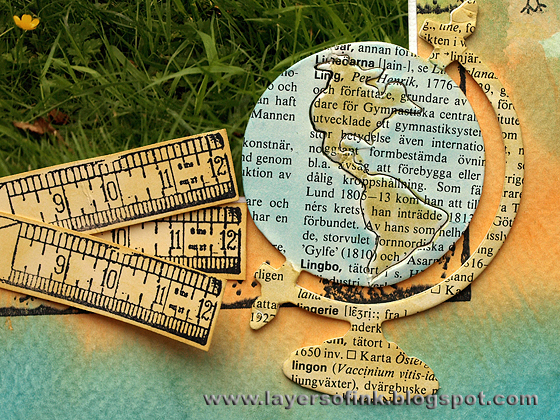 A piece of old dictionary paper was glued to white mat board and then the little globe was cut from that. I inked it with Shabby Shutters, Tumbled Glass and Scattered Straw, using a craft nib for the small spaces. The light bulb was stamped on modeling film with Stazon ink and the title was stamped inside it. When the ink was dry, I heated the film with my heat gun and shaped it a bit. Modeling film keeps its shape when it cools down. 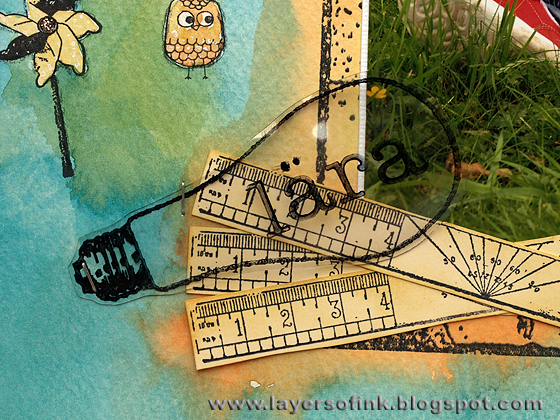 The ruler was stamped three times on manila cardstock and inked with Scattered Straw. I love the yellow and blue flying cow and the fun little wagon.I matted the watercolour cardstock on white cardstock and stitched a frame with my sewing machine. 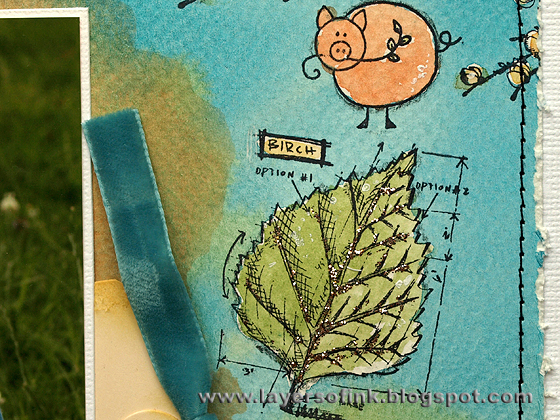 Love this Birch leaf from the new Tim Holtz Stamper's Anonymous Mini Blueprints. ﻿Hi everyone! 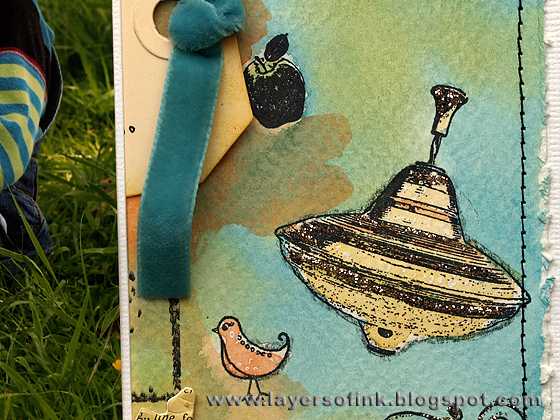 Today I have another pop-up card to share, using Sizzix Karen Burniston's pop 'n cuts dies, as well as a bunch of Tim Holtz's Alteration dies. 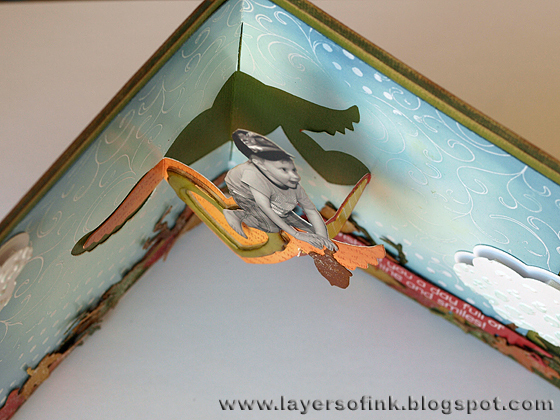 If you want to see a step-by-step tutorial for a pop-up card, I posted one a few days ago, you can find it here. Pop-up cards are perfect for kiddies birthday cards and I needed a card for my nephew's birthday. This is the outside. 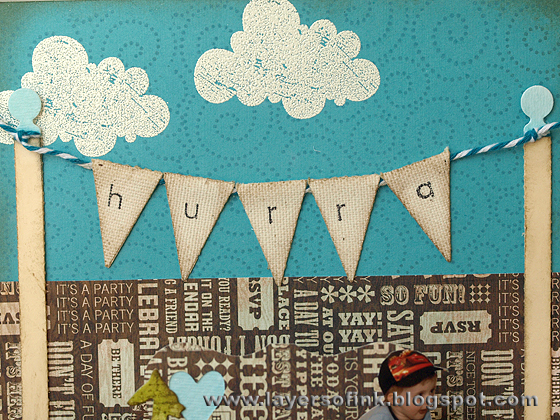 The sentiment translates 'Happy birthday' and was stamped with alphabet stamps on a ticket strip cut from manila cardstock, inked with Frayed Burlap. 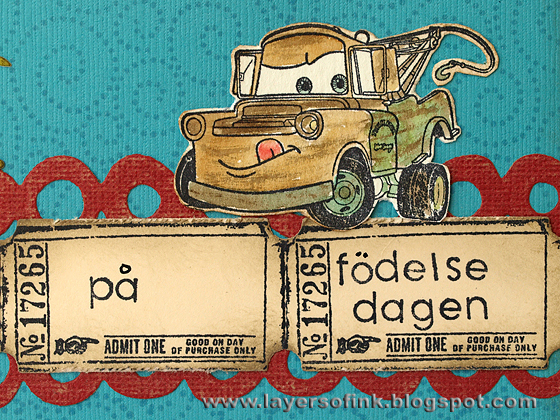 The piece behind the tickets is from the Washer Border die, cut from kraft core cardstock. 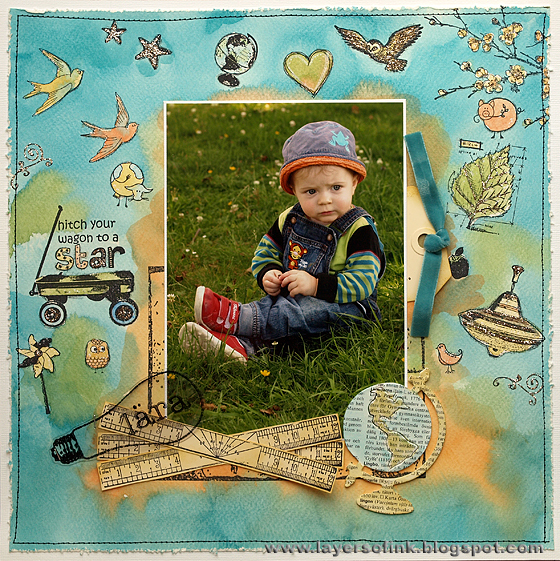 The background was stamped with a swirl stamp. 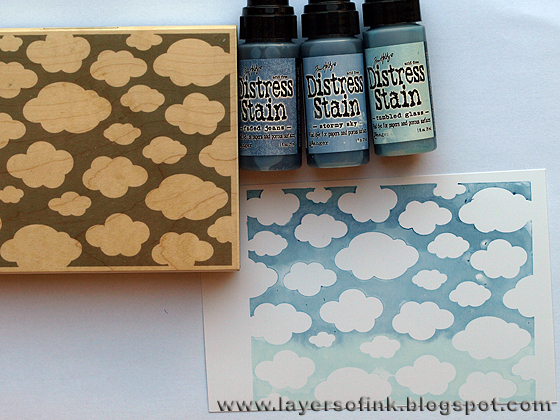 The clouds were white embossed and picked up the texture of the cardstock which made them look pretty distressed. For weeks, my son waited for his Mater stamp to arrive in the mail, and since his cousin loves this character too, I borrowed the stamp. He was stamped with Archival Jet Black ink on watercolour cardstock and watercoloured with Distress Inks. The trees were cut from a piece of watercolour cardstock, which had first been coloured with Peeled Paint Distress Stain. I added a bit of brown to the trunks and stamped them with an envelope pattern stamp. And here's the fun inside. I used patterned paper for the pop-up part, and it is a bit hard to see on this photo. Since the Label pop-up is a Movers & Shapers die, I could place a little heart in the one corner, inside the label part, cutting everything at the same time. 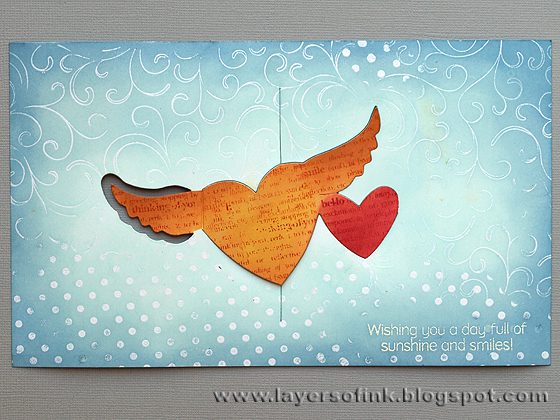 I used the heart on the outside of the card and backed it with a left over piece from the car. 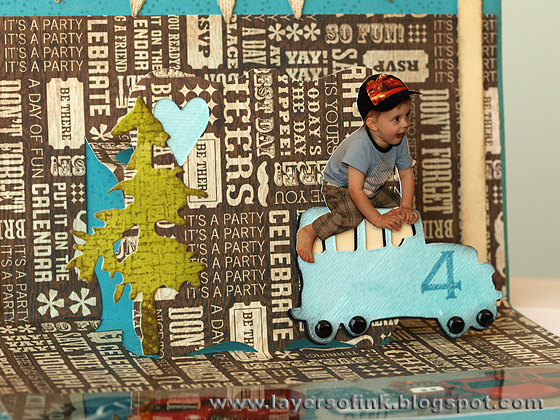 You might recognise that photo from my pop-up tutorial, here he is sitting on a car on his way to the birthday boy. 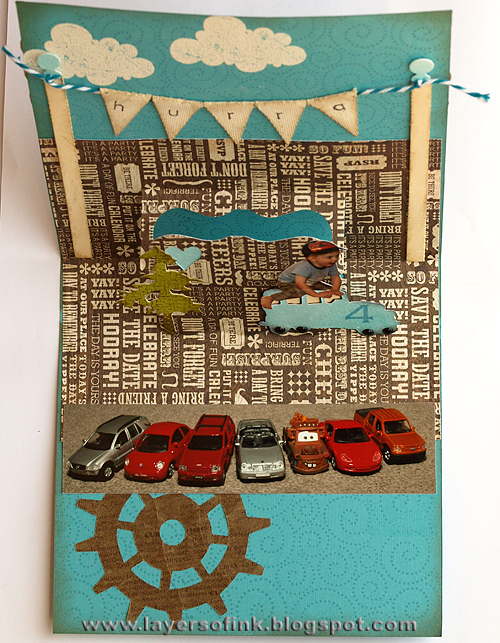 The car was die cut from a scrap piece of watercolour paper, which I think had been coloured with Salty Ocean. 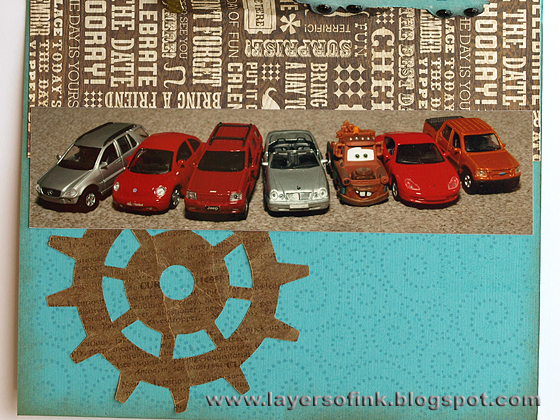 I cut the car one more time from black cardstock, to form a slight shadow to the blue car. 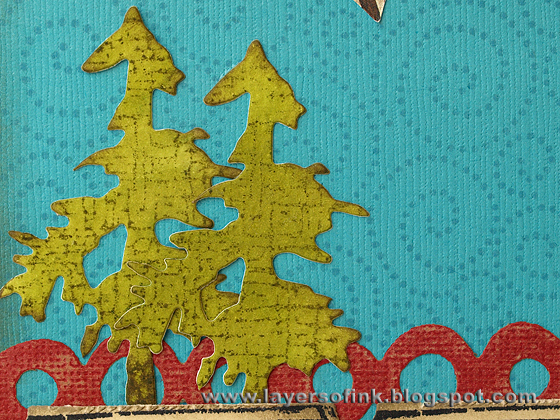 I love the shape of the little pine tree, and it is not only for Christmas projects. The clouds were white embossed as on the outside of the card. The fun banner and poles were die cut with the Flagpole with Lantern & Sign Sizzlits. The poles were cut from manila cardstock and inked. The banners were cut from canvas, stamped with alphabet stamps, inked and folded over a piece of baker's twine. 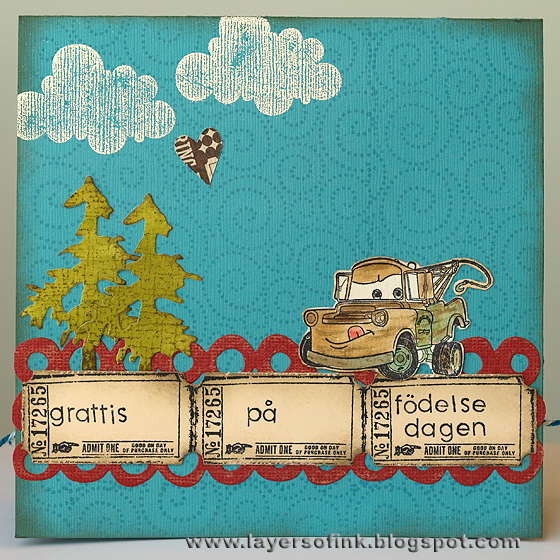 Since cars are a big interest of the recipient (and his cousin), I added a car photo to the card. The gear was in my scrap box, it is cut from kraft glassine paper and stamped with a text stamp. You see the pop-up part better on this photo. Hi everyone! 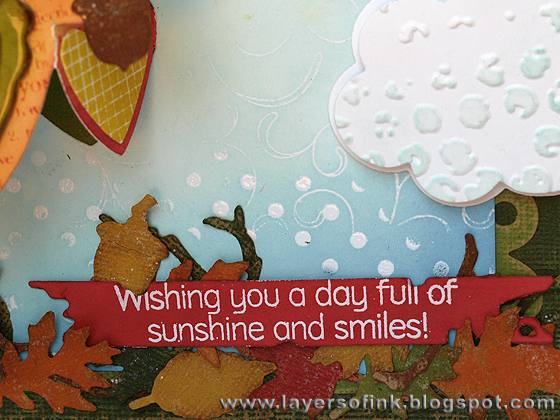 I am having so much fun playing with Karen Burniston's Sizzix pop 'n cuts dies. Today I am sharing a step-by-step tutorial for a pop-up card, also using a bunch of other dies and inking and stamping techniques. I added two cut out photos to the card (both kiddies and grandparents would love this card). 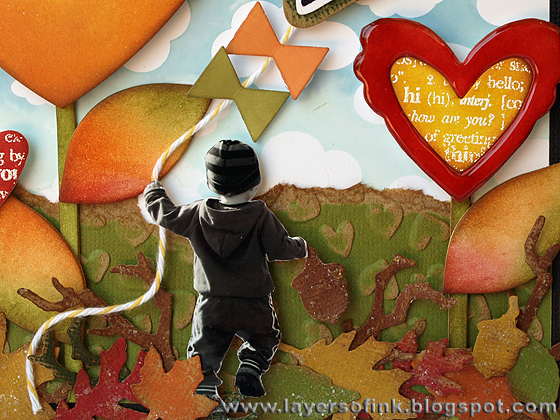 Here's the front of the card, a fun autumn scene. And when you open it, there is a pop-up surprise waiting. 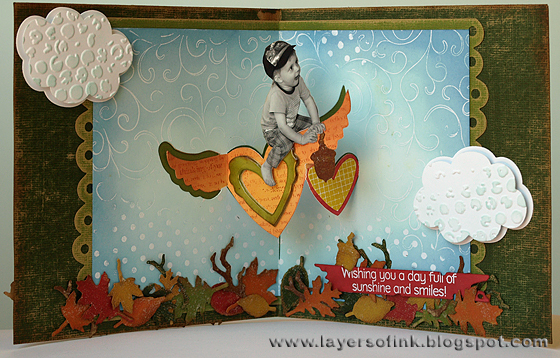 I like repeating elements on the outside and inside of pop-ups, here: hearts, clouds, leaves, text and the colours. 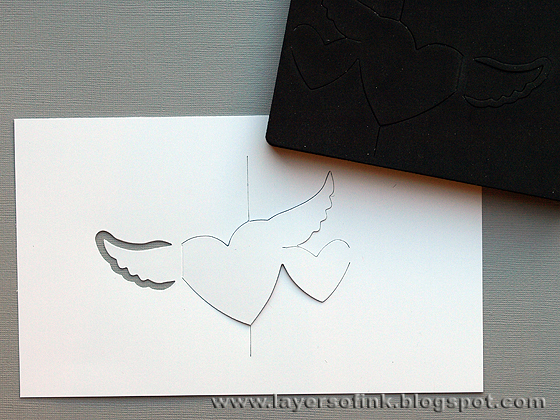 Starting with the outside of the card, die cut the Heart, Stem & Leaves and the Heart & Wing set from white mat board. Cut the Heart & Wing twice, but only the heart, not the wings. White or clear emboss a sentiment on the large heart and a text stamp on the two small hearts. 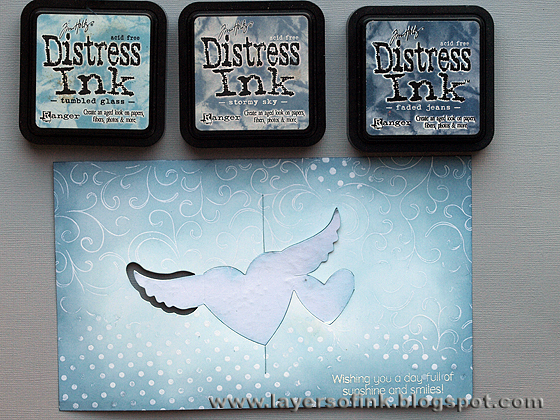 Ink them with fall colours of Distress Ink. 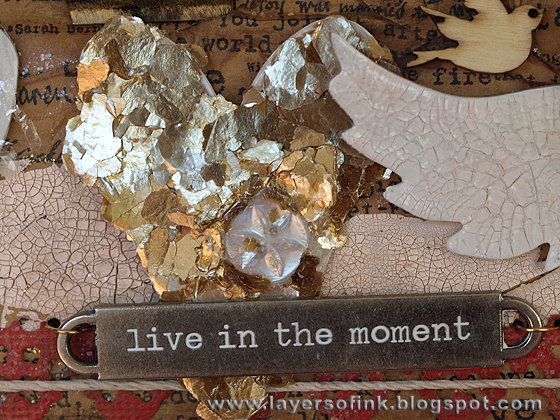 I used Mustard Seed, Wild Honey, Rusty Hinge, Fired Brick, Peeled Paint and a bit of Vintage Photo. Mat board inks very well. Wipe the ink off the embossed parts. 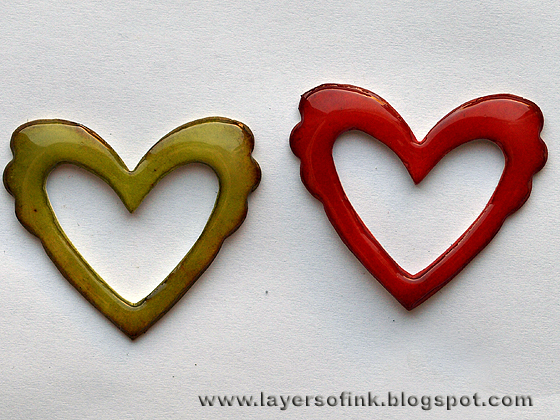 Coat the two 'frame' hearts with Glossy Accents. 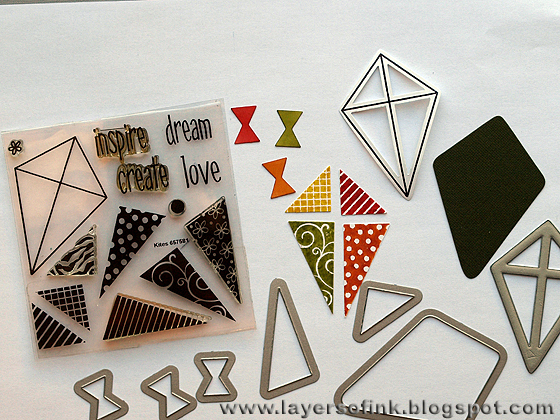 Here are all the pieces for the kite, from the Kites Framelits set, which includes both the dies and coordinating stamps. The piece to the far right is green kraft core cardstock, it looks black on the photo. 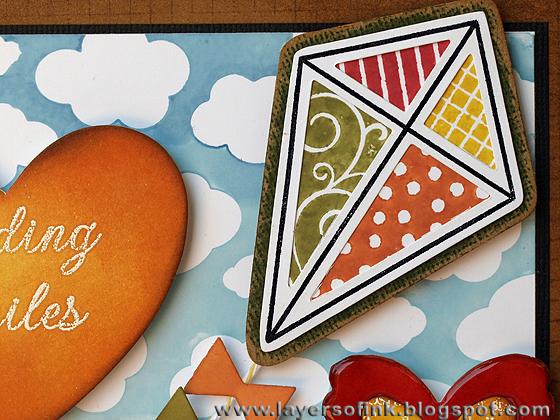 I used Specialty Stamping paper for the rest of the kite (love this paper). The pieces of the kite were stamped with the same colours I used to ink the hearts (Mustard Seed, Fired Brick, Peeled Paint and Rusty Hinge) and I also used them to ink the little flags. The 'frame' was stamped with Archival Ink Jet Black. I wanted to try something with this cloud stamp and inked it with three colours Distress Stain, starting with the lightest (Tumbled Glass), and going gradually darker, letting the colours overlap a little bit. Then it was stamped on Specialty Stamping paper. Love the result! 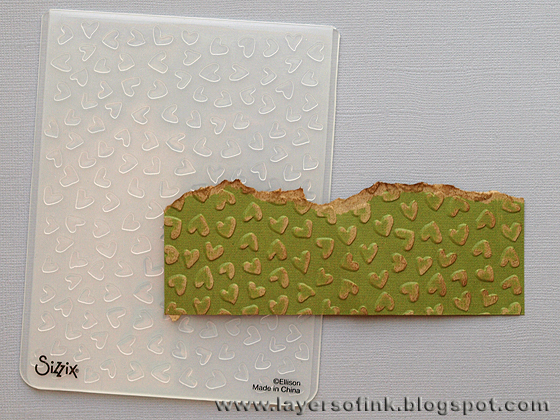 I tore a little piece of green kraft core cardstock for the hill and embossed it in a heart folder. Then it was sanded and inked. Don't all these leaves just look so great together? It looks like it took forever to make them, when in fact it was real quick. 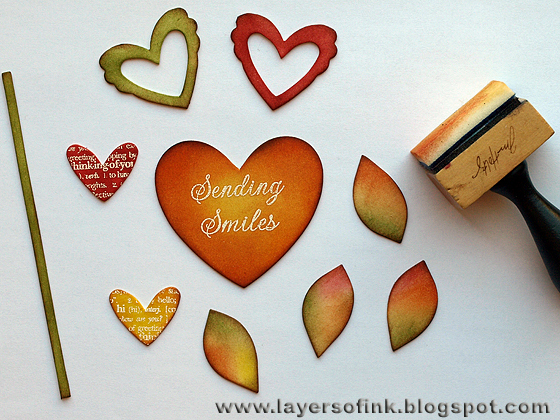 Die cut leaves and branches from different colours kraft core cardstock using the Autumn Gatherings die. You get a lot of leaves and branches from one strip of paper. 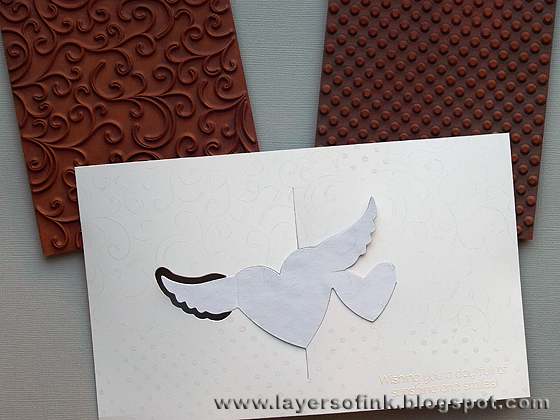 Sand them before removing the pieces from the surrounding cardstock. 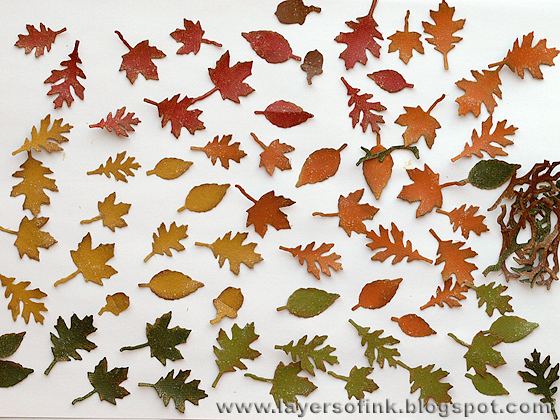 Much easier than to sand each individual leaf. Ink and add some Rock Candy Distress Stickles to each one. Just a quick swipe with your finger is enough, Distress Stickles looks better if it is a thin layer. Leave to dry. Now to the inside. 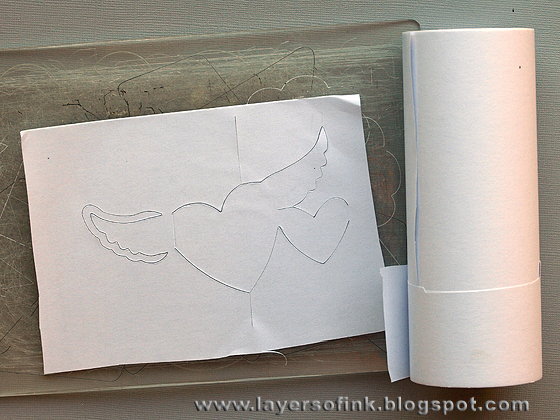 Die cut the Winged Hearts pop-up from Specialty Stamping paper. If you don't have the pop 'n cuts base die, you can use the ordinary base tray. Don't fold the pop up yet, it will make the inking harder. We need to make a mask for the inking. Die cut the pop-up again, but this time from Eclipse tape. Place the non-sticky part of the tape on the die. If you don't have Eclipse tape, you can use a sticky-back note, but the tape does make it easier. Carefully peal the mask from the cutting pad and cut the two parts apart. Keep both, we need both the positive and the negative mask. My mask picked up some tiny bits and pieces from my cutting pad. It might have been a good idea to place a scrap piece of paper in between, or a thin piece of acetate. Place the mask over the hearts and wings. Clear emboss background stamps on the background. I stamped them with my hand and not mounted on an acrylic block, for a less perfect impression. I white embossed the sentiment, but later decided not to use it. Keep the mask on, and ink the background with the same shades of Distress Inks as used for the cloud stamp. Be careful around the mask so that the edges don't lift. Remove the mask. Place the negative mask around the hearts and wings. I wished I had made my mask a little bit longer, because the little heart was a bit too close to the edge. 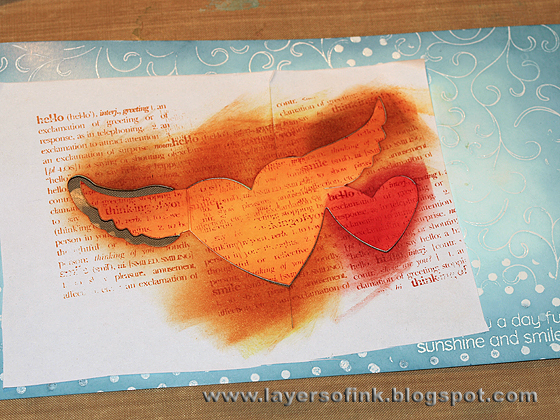 Ink the large heart and the wings with Mustard Seed and Rusty Hinge, adding a bit of Fired Brick. Ink the small heart with Fired Brick. When the ink is dry, stamp with the same text stamp used for the little hearts on the front of the card. Remove the mask and you get this. Die cut two of each of the clouds from the Kites Framelits set from Specialty Stamping paper. 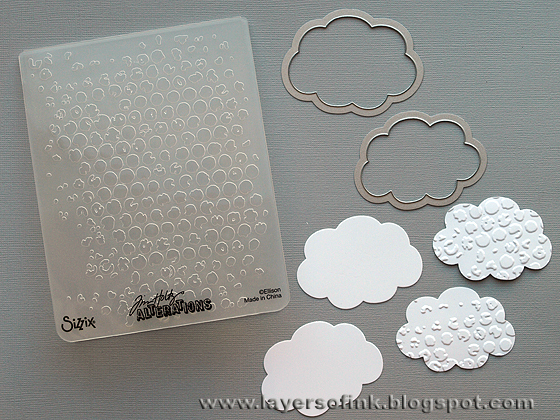 Emboss the two smaller clouds in the Bubble folder. 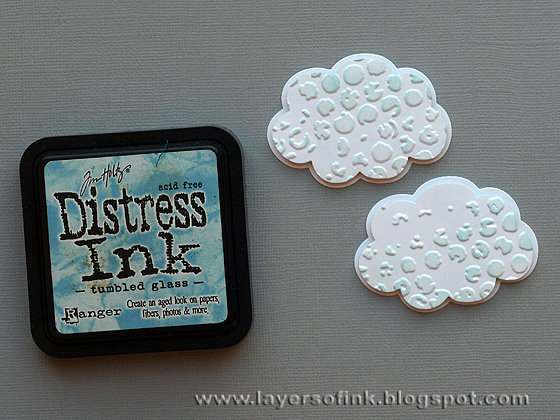 Ink the embossed bubbles lightly and then layer the smaller clouds on the larger clouds with foam tape. The larger clouds form a perfect mat for the smaller ones. 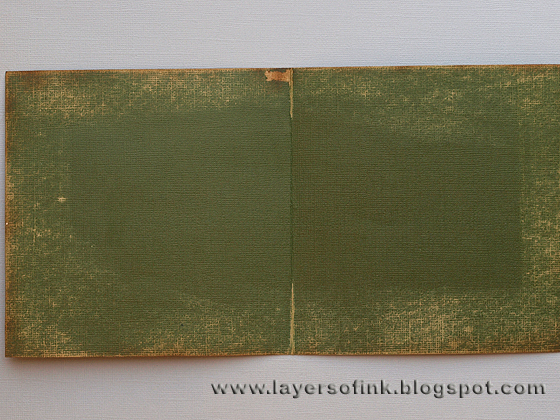 For the base cardstock, I used a piece of green kraft core cardstock, folding it with the kraft part on the outside. 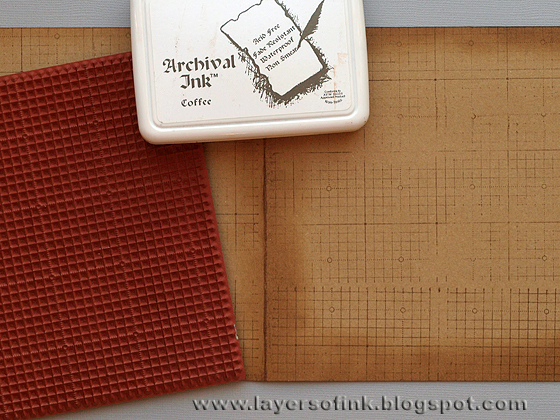 It was inked with Vintage Photo and stamped with a grid stamp using Archival Ink Coffee. I sanded the inside to reveal the kraft core and inked it. I wanted to mat the pop-up part on another shade of green kraft core and die cut both edges with the Scallops On the Edge die. Sand the cardstock. Time to assemble everything. 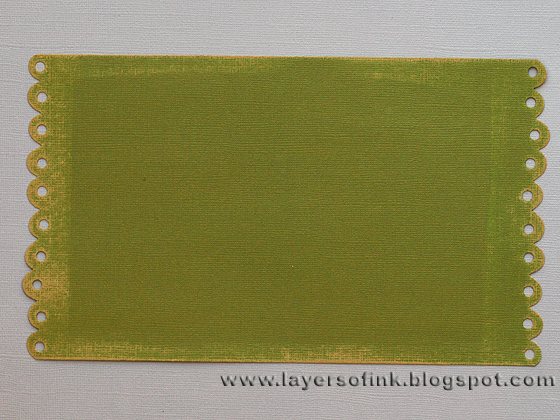 Adhere the clouds and the green hill on a black mat and then glue to the base cardstock. Find a photo that fits and cut it out. My son holds a balloon in the original version of this photo, so it worked nicely with him holding the kite. I also glued an acorn to his other hand. Assemble the kite and add a piece of twine to it. Adhere with foam dots. 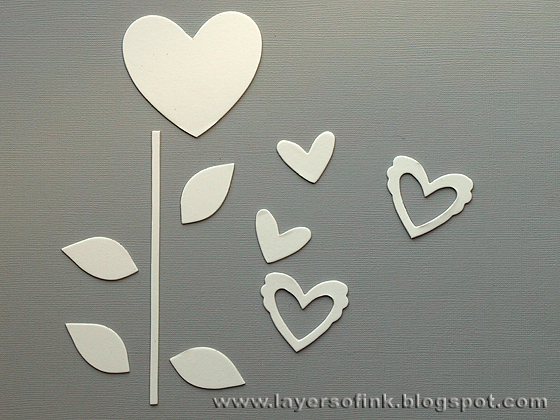 Adhere the hearts with foam dots for dimension, add stems and leaves. 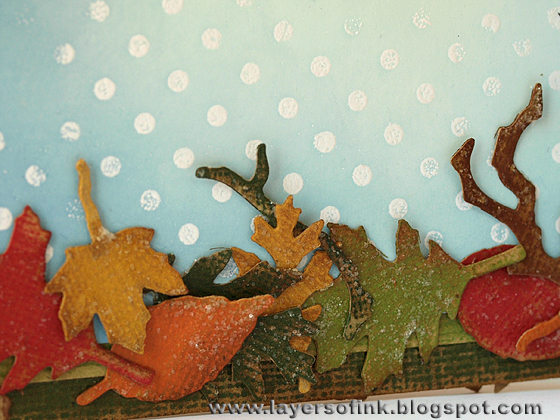 Then glue a lot of leaves and branches at the bottom of the card. I used another photo of my son on the inside, making it look like he is flying on the hearts (needless to say, he loves this card). He holds an acorn here too, as on the outside. 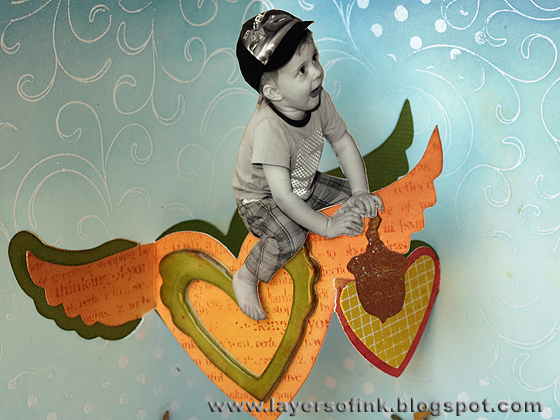 The Heart & Wing set Movers & Shapers die coordinate perfectly with the Winged Hearts pop-up die and I added one of the Glossy Accent hearts to the big heart and die cut a small heart from a piece of Specialty Paper which had been stamped with a grid stamp, using Mustard Seed. This was glued to the red heart. 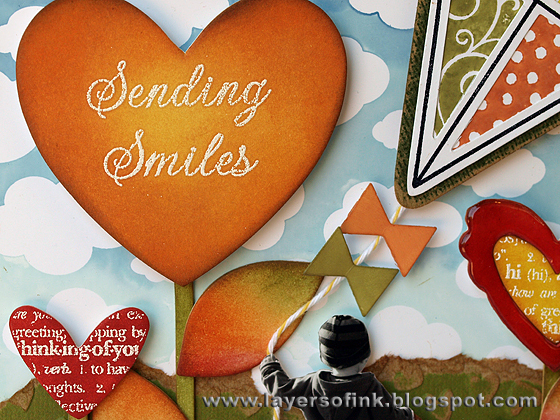 The pop-up die both cuts and scores the cardstock so it is very easy to assemble. First fold it, then apply adhesive to one side. Place it in the fold of the base cardstock and stick it down. Then apply adhesive to the other side and fold the base cardstock over it. You can find a video explaining this here. 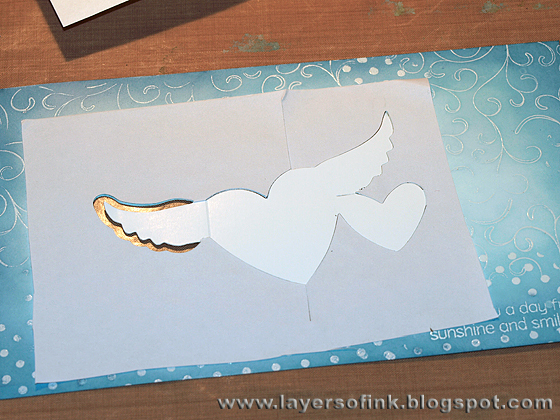 Place the clouds so that they don't bump into each other when you close the card (since that would make it very bulky). The original sentiment disappeared, so instead I cut a banner from Specialty Stamping paper, clear embossed the sentiment on top and inked it with Fired Brick and Aged Mahogany. Glue leaves and branches along the bottom. So many fun possibilities with the pop 'n cuts dies! I will share another two photo pop-ups in a few days time and a pop-up layout next week. Thank you for looking at this long post! Hello everyone! This week at Simon Says Stamp and Show the challenge is 'for the love of sparkle', so create something with a bit, or a lot (! ), of sparkle and shine and join us this week. I love mica with its beautiful natural sparkle and imperfections. Even as a child, I used to love finding stones with a bit of mica glimmer. So for this week, I made a wall-hanging from recycled cardboard celebrating all things mica. This was a hard project to photograph, since it is very sparkly and since it is long and narrow (30 x 6 cm). You can see the details better on the photos below. I found a piece of cardboard and and used it just as it was. 7Gypsies Life Collage tissue paper was glued on top with multi-medium. I love the different quotes on this tissue paper, and there is even one about mica, so it was perfect for my project. Then I tore off a little bit of the top layer here and there. 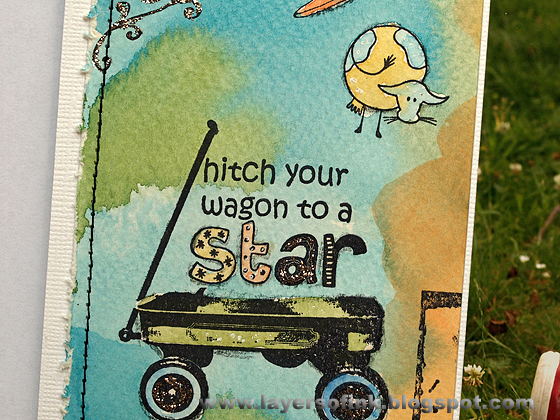 The background was stamped with a dot stamp using Versamark and gold embossed. I painted patches of Tattered Rose Distress Crackle Paint here and there and let it dry. Then the background was inked a bit with Vintage Photo and Walnut Stain. Finally, I applied Rock Candy Distress Stickles almost everywhere for even more shine. To hang the wall-hanging, I put two Hinge Clips on top, which were first coloured a bit with gold alcohol ink. Then I simply tied a piece of twine through the clips. You see the gold embossed dots better on this photo. All the hearts and the wings were die cut from grungeboard and painted white. The wings were painted with Rock Candy Distress Crackle paint and when dry smeared with a bit of Rock Candy Stickles. 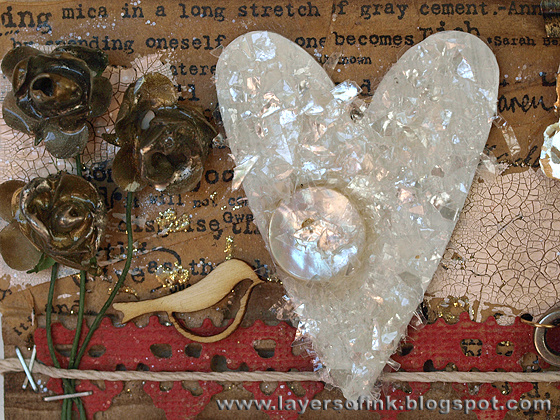 The hearts were coated with Glossy Accents and then I added a vintage button to each one. 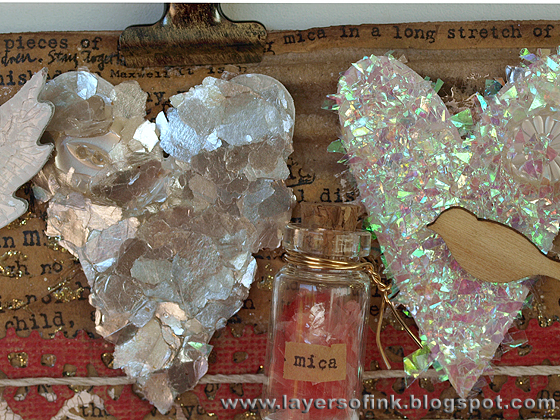 Each heart was covered with a different colour and type of mica flakes. On this pink heart I used Melissa Frances Pink Snow Mica Glitter. 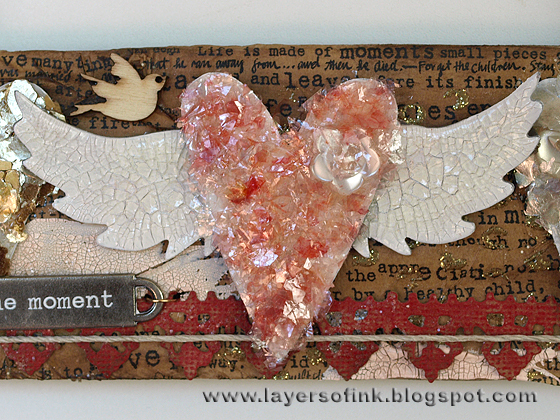 On these two hearts I used Stampendous Pearlized Mica Fragments and Shaved Ice. You get a lot of mica flakes in a jar, it will last a long time. The pearlized ones are my favourites. I added three Studio Calico wood veneer birds to the wall-hanging, since I love birds. 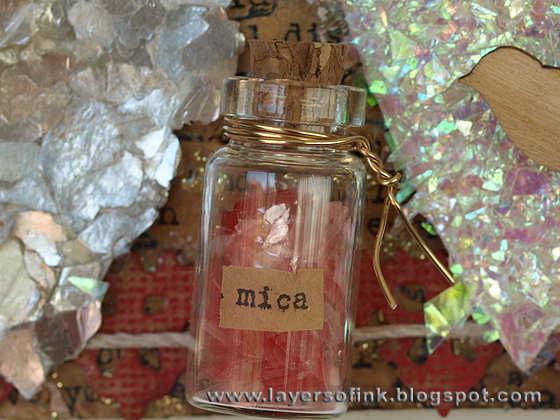 I filled a Tim Holtz corked vial bottle with some of the pink mica flakes and cut out the word 'mica' from a left over piece of tissue paper. It was attached to the wall hanging with wire. This heart was covered with Stampendous Gilded Mica Fragments. A bit of paint was rubbed into the words of the Word Band to make the text more visible. It was attached with wires. 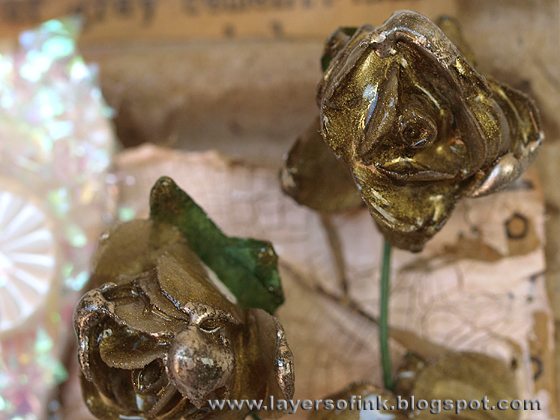 I wanted to make gilded flowers to add to the wall hanging (see this tutorial on faux porcelain flowers by Tim Holtz). I melted clear UTEE in my melting pot and then added a bit of gold UTEE. The flowers were dipped into the UTEE. Then I made a second batch adding Platinum UTEE instead of gold, and dipped the flowers a second time, not covering them completely. Be careful, the UTEE gets very hot. Here's a close-up of the flowers, the mix of gold and platinum gives them a great look. Quite different from the white roses I started out with. The last heart was covered with Melissa Frances White Mica Flakes. 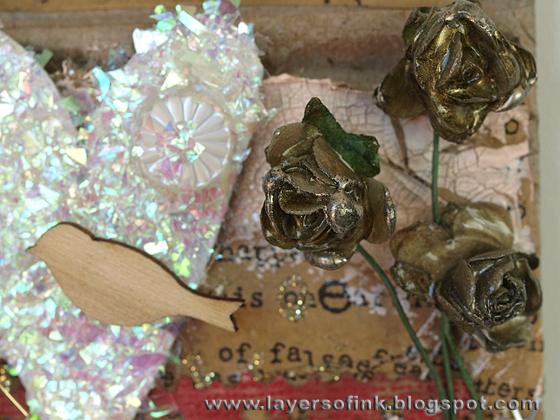 I also die cut a Vintage Lace from red kraft core paper, sanded and coated with Rock Candy Distress Stickles. I hope you will join us this week and show us your sparkly projects. 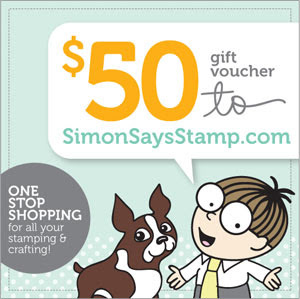 As always, Simon Says Stamp gives a $50 gift voucher to one random (and lucky) participant, who can do some fun shopping.